As summer draws to a close, kids go back to school, and tans begin to fade, many of us long for the cozy sensations and scents of another gorgeous fall in Big Canoe. Whether we’re picking apples and baking pies, sipping cider, carving pumpkins, or going on a festive hayride, there are endless things to do around here once the weather begins to cool and the leaves begin their glorious seasonal wardrobe change. – Find your apple place! North Georgia is known for its many apple orchards and apple houses, and many of these historic orchards are just a short drive from Big Canoe. Mercier Orchards is less than an hour away in beautiful Blue Ridge, and features hayrides, a cider tasting room, apple picking, and homemade baked goods and crafts available in their large market. – Take a hike! Some of the best leaf-peeping in Georgia can’t be seen through car windows. If you’re looking for a moderately difficult day hike with spectacular views, we love the Gahuti Trail at Fort Mountain State Park, an easy drive down GA Highway 52. – Get festive! 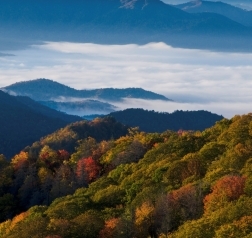 There are many fall festivals in North Georgia, but we’re partial to the Foxfire Mountaineer Festival in Rabun County and the Georgia Apple Festival in Ellijay. Southern food and Appalachian culture abound at these local celebrations where families and friends come together to celebrate the wonders of autumn.